DRT International Inc.’s CEO, Desmond Falla attended the TPF General Assembly Meeting, in São Paulo City, Brazil from May 17th-19th, 2013 where he serves as the Chairman. The TPF Meeting consists of representatives from freight forwarding companies from North America, Europe, Latin America and Asia. These forward thinking leaders meet once a year to discuss current and future international transportation systems. The assembly is also available to offer recommendations to improve their service offerings to members’ mutual customers. Mr Falla was accompanied by DRT’s Director of Operations, Gregory Willocks who serves as a committee member for TPF’s General Assembly Meeting (GAM). This committee stresses that the leadership of each individual person within a singular company influences the growth and changes within TPF. 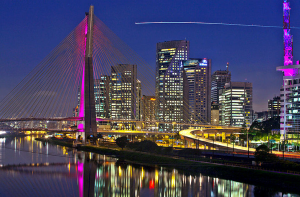 The GAM was welcomed by a reception at Terraco Jardins Restaurant in the Marriott Hotel in São Paulo. On Saturday, the team met to discuss ways to further develop and strengthen as a committee and then met in a more social atmosphere at TPF’s Gala Dinner at the São Paulo Athletic Club. The members are excited about positively impacting the future growth and changes within their own companies as well as reconvening again next year.